The recent price hike for cigarettes have caused an uproar among the smokers in Malaysia with some brands going up as high as RM18 per box. On the other hand, a recent crackdown on vape juices (e-liquids) with nicotine by the Health Ministry has also caused outrage amongst vape store owners who have had their stocks confiscated by Health Ministry officers. It was reported that in Selangor alone, over 300 vape stores were raided in the beginning of November. Under the Poisons Act 1952, the sale of nicotine can only be undertaken by licensed pharmacists and registered medical practitioners, and is prohibited by other parties. Similarly, under the existing legislation, the sale of e-liquids with nicotine can also only be supplied by registered medical practitioners and licensed pharmacists. However, pharmacists are saying they are not keen on selling vape juices. There have also been calls for vape to be regulated as well as for it to be taxed. The government has announced that it will set up a special committee to look into vaping. It is also interesting to note that the vape industry in Malaysia is worth half a billion ringgit and is the second largest in the world after the American market. So with the cigarette price hike and controversy over vaping, let’s see the cost of smoking vs vaping, and how much the habit is really costing smokers and vapers. 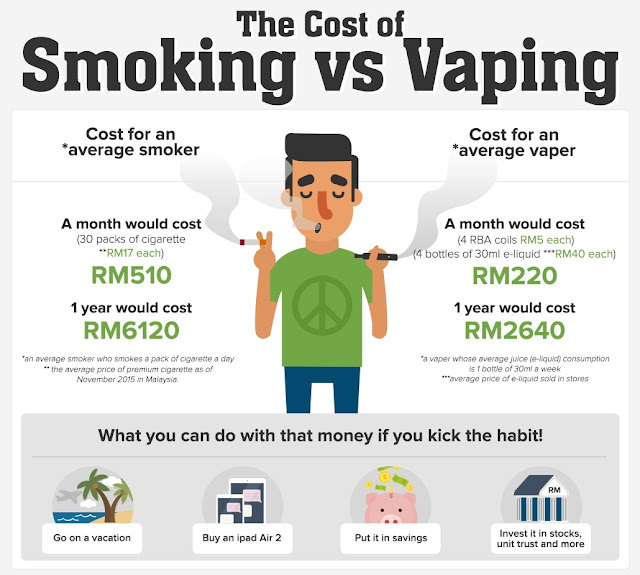 Whether it is smoking or vaping, quitting the habit altogether would save you a cool RM6,120 or RM2,640 a year! Rather than let all that money go up in smoke (literally!) you could do plenty if you were to curb that habit. With the money saved, you can spend it on a vacation, or put it aside to build up your savings. You can learn how to stop smoking by checking out quit smoking clinics available across the country. The National Poison Centre also has smoking cessation services to help smokers stop smoking as well as passive smokers looking to help their loved ones quit smoking. Smoking cost me a lot i was a smoker back in the days and want to quit smoking and want some thing in exchange because quieting is hard so i tried vaping and from that day i never smoke a cig.